Due to the decline of the traditional sugar and banana exporting industries, many cash strapped Caribbean islands have been resorting to an unusual and controversial method to raise revenue—selling citizenship. While economic citizenship programs already exist in Austria, Bulgaria, Britain, and Canada, they often take several years for the applications to be processed—while in the Caribbean it only takes a couple of months. While no specifics on the nationalities involved have been released, it has been widely circulated that those most interested in the economic citizenship program are primarily the wealthy from China and the Arab World. Since September 11, there has been a crackdown on granting visas to individuals from Arab/Muslim countries, and as such Caribbean citizenship provides a way to avoid the travel restrictions. Furthermore, the political instability in Iran, Syria, and Egypt has provided an incentive for individuals to secure a second passport in order to access a distant safe haven such as St. Kitts and Dominica. 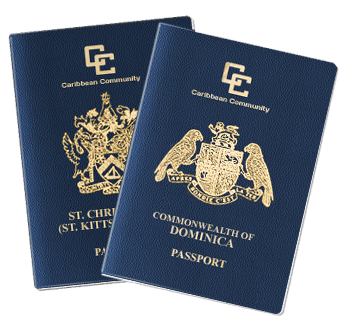 In St. Kitts and Nevis, citizenship can be obtained through two different methods. The first involves a minimum “non-refundable donation” of US$250,000 by a single individual to the Sugar Industry Diversification Fund (with an additional US$7,500 in government fees). The second way to obtain citizenship is through a minimum real estate investment of US$400,000, which is subject to associated taxes and fees. However, this process is also evolving into more than just a straight forward cash for citizenship transaction and is now being folded into development projects. This summer, the Dubai based Range Developments announced plans to construct a luxury Park Hyatt hotel in St Kitts & Nevis. The developer has offered investors spending more than $400,000 to apply for citizenship of St. Kitts. In Dominica, the fee for their program is $100,000—taking between five to nine months. Unlike St. Kitts, the process requires that applicants speak English and visit the island for an interview. It was estimated that in 2012 alone, approximately 1,500 people have applied for the citizenship investment program in St. Kitts and Nevis and 500 for Dominica. Dominica’s citizenship program has been less popular than St. Kitts due to the fact that there were travel restrictions concerning the countries of the European Union. However, that restriction is now in the process of being lifted, and Dominica should soon see an increase in the number of citizenship applicants. Most recently, Antigua has joined St. Kitts and Dominica seeking to gain revenue off of granting citizenship to foreign nationals. That said, the country is also worried about the darker side of implementing an economic citizenship program—specifically in regards to whether the actions of the new citizens will jeopardize the freedom of movement for Antiguan born citizens. In the Jamaica Gleaner, David Jessop called for tight monitoring and regulation of the citizenship programs, as poorly enforced programs could lead to a rise in criminal activity or worse. Crispin Gregoire, Dominica's former ambassador to the United Nations has remarked that "I am not a fan of the economic citizenship program... As it stands, it encourages people with something to hide. I understand that it must be a big source of income for the state, but they're not doing a good job of regulating it." Additionally, such programs highlight the inequality in resources between the new citizens of these Caribbean islands and the traditional population. It reveals the extent to which these economically vulnerable countries will go to gain much needed revenue sources. Due to their wealth, those with new citizenship have access to travel and investment opportunities which are out of the reach of the average Caribbean citizen. Without any transparency and regulation, the benefit to the populations of these Caribbean countries is outweighed by the possibility of losing their freedom of movement to countries which are home to large Caribbean diasaporas such as Britain, Canada and the United States. The economic citizenship programs also provide a direct stream of income which could be captured by political parties if regulation and transparency is not adopted and made available to the public. While the popularity of these programs are still fairly new, there is no reason not to call upon the governments to immediately show where the money is being directed—as they now constitute important, albeit controversial, sources of revenue.